August 9, 2014 – I remember exactly what I was doing and where I was forty years ago today when President Nixon resigned. I was vacationing at my parents’ home on Route 20 West in Morrisville, N.Y., watching his speech the night before on my parent’s large-screen color television set. By this time in history, my parents’ support for Nixon had dissipated and we watched the speech with some relief. He was not the first president to secretly record conversations in his office, or lie to the American people, or undertake illegal acts in the dubious cause of national interest. He did arrogate to himself the power to secretly bomb Cambodia, which I thought was a war crime – and which then Rep. Elizabeth Holtzman (D-Brooklyn, N.Y.) of the House Judiciary Committee added to the articles of impeachment. By August 9, 1974, there was not a lot of goodwill for RN around my parents’ neighborhood. He was never entirely likable but a lot of people ignored his tricky deviousness because he was Ike’s vice president. When I was in elementary school, My Weekly Reader wrote nice articles about him. 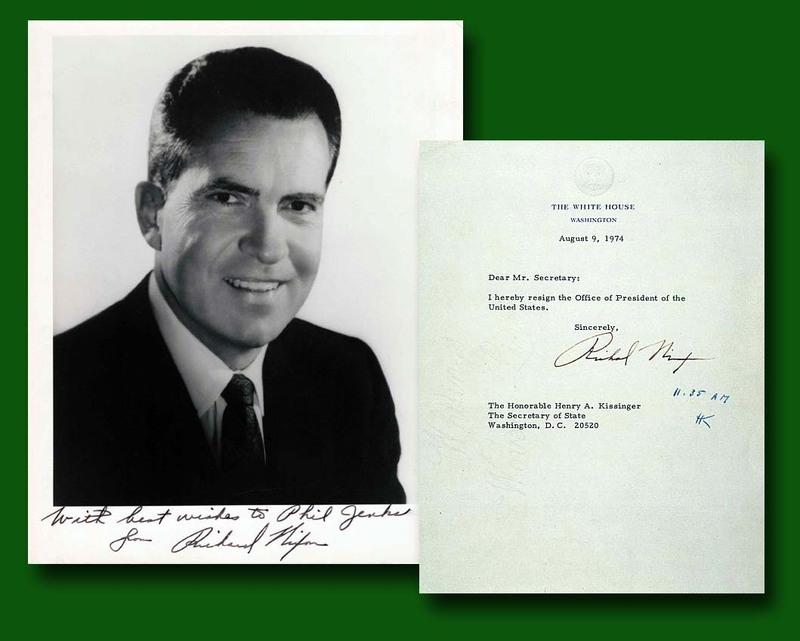 And in 1962, he seemed benign enough that I included him in my target list of politicians whose autographed pictures I wanted. I told that story here. Later, when I tried to make an appointment to interview Lawyer Nixon for Smoke Signals, the Morrisville-Eaton Central School student newspaper, I received a polite demurer from Rose Mary Woods, another future Watergate figure. I interviewed Colson for The American Baptist magazine and found him rather likable, although his newly acquired devotion to Jesus seemed as uncompromisingly relentless as his Nixon devotion, and not in a good way. At one point Colson asked if I’d like to do write under his byline for his Prison Fellowship organization. I was never sure if the offer was sincere or gratuitous, but I let it pass. One of my wiser career choices. Forty years on, there’s little question that Watergate, Nixon’s surreptitious and illicit management style continues to have a complicated impact on presidential leadership. Today overreaching Republicans are hinting about impeaching President Obama for exceeding his authority, and the President sends U.S. bombers to attack militants in Iraq without Congressional approval. None of this, of course, is Nixonian in its reach. But all the same, it’s beginning to seem like a never-ending story.